Sea of Tranquility, March 22, 2015 -- McDonald's, the ubiquitous globe-girdling fast food purveyor, announced today it will be expanding its operations beyond the confines of the earth's atmosphere with the launch of the first lunar franchise. The move marks not only the very first non-terrestrial McDonald's retail dining establishment, but the first non-terrestrial commercial franchise of any kind whatsoever. "It seemed a logical progression," said Ray McSpokesman, spokesman for McDonald's. "We're beginning to notice a certain saturation effect in terrestrial McDonald's restaurants, which may be a function of the current distribution of one McDonald's restaurant for every square kilometer of the earth's non-aquatic surface, including Antarctica, where, of course, our Flipper McPenguin has been a smashing success. There was literally nowhere to go but up." The Lunar McDonald's, dubbed the McMoon, will be a small, primarily drive-through franchise similar to the ones located at the top of the Eiffel Tower and among the ancient Incan ruins of Machu Picchu in Peru. Due to the high cost of providing affordable living space and life support technologies, all food preparation, serving, cashier duties and maintenance will be performed by a crew of specially designed robots. According to Mr. McSpokesman, McDonald's plans to subsequently adapt these new technologies to its full range of earth-bound McDonald's restaurants, potentially saving thousands in annual labor costs. "The robot staff should save us a bundle, both up there and down here," said Mr. McSpokesman. "On the McMoon," he continued, "we'll be catering, at least initially, primarily to visiting astronauts and their friends and spouses. Because of the high cost of transporting vivid orange and red plastic building materials to the moon, the interior seating area will be quite small. We'll adopt our usual 'ten minute table limit' policy, however, which should keep the traffic moving at a brisk pace." 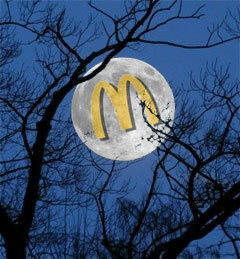 According to Mr. McSpokesman, McDonald's does not expect the McDonald's McMoon franchise to achieve profitability in its own right within the next decade, banking rather on the ancillary benefits created by the lunar restaurant's unique and highly visible location. "Any time we put up a new restaurant, however tiny, we broadcast its presence with a sign that, by design, dwarfs anything else within several thousand yards," said Mr. McSpokesman. "It's called branding. Our first step in establishing the McMoon will be to get our logo up there where everyone can see it. Then, to be frank, it really doesn't matter if anyone actually eats at the restaurant. It's all about getting the McDonald's trademark imprinted on the juicy five-and-under demographic, our primary target market, as early as possible. You ever notice how excited a little kid gets when he looks up and sees the full moon? Gold mine." McDonald's shares were up 3 1/4 on the announcement in active late-afternoon trading. Fed Chief Bernanke Ups Interest Rates 1.25% "Just To Mess With People's Heads"
Rogue Societe Generale Trader "Just Got His Millions and Billions Mixed Up"